#2 hook weighs 6.4 grains ~ 1 strip of Â¼" wide 2 mm foam for a wet-fly pattern. Total weight of finished hopper is 9.8 grains. 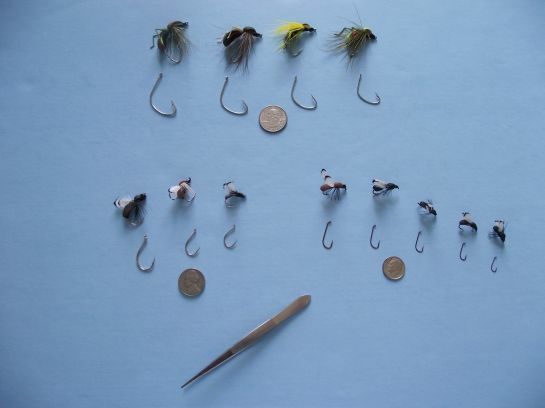 #2 hook weighs 6.4 grains ~ 2 strips of Â¼" wide 2 mm foam for a dry-fly pattern. Total weight of finished hopper is 11.4 grains. #4 hook weighs 4.6 grains ~ 1 strip of Â¼" wide 2 mm foam for a wet-fly pattern. Total weight of finished hopper is 7.8 grains. #4 hook weighs 4.6 grains ~ 2 strips of Â¼" wide 2 mm foam for a dry-fly pattern. Total weight of finished ant is 10.2 grains. Bottom row, right: Mustad-Viking Hooks ~ #6, # 8, #10, #12, #14 â€” mainly for freshwater applications.